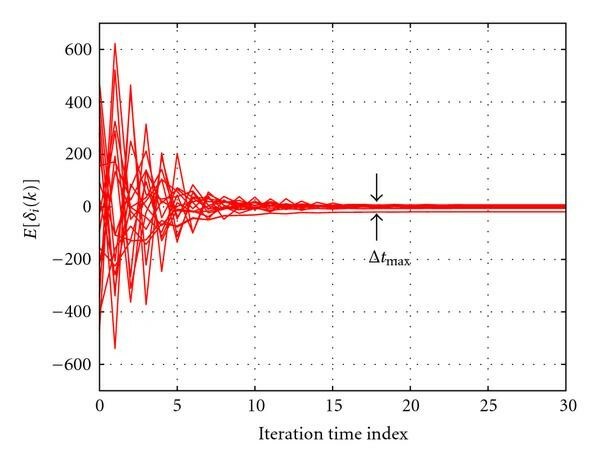 This paper proposes a novel discrete-time second-order distributed consensus time synchronization (SO-DCTS) algorithm for wireless sensor networks. The consensus properties and convergence rates of the SO-DCTS algorithm are analyzed for both directed and undirected networks. Additionally, the convergence region and optimal convergence rate of the SO-DCTS algorithm are determined for undirected networks and this convergence rate is shown to be superior to that of the first-order DCTS (FO-DCTS) algorithm under careful algorithm design. Furthermore, the asymptotic expectation and mean square synchronization error are investigated for the SO-DCTS algorithm when there is Gaussian delay between network nodes. Finally, simulation results are provided to verify these analytical results. Wireless sensor networks are typically comprised of inexpensive, small-sized, power-limited terminals. In a variety of applications, these sensor nodes are collectively required to maintain accurate time synchronization, for example, moving object acquisition and tracking, habitat monitoring, reconnaissance and surveillance, environmental monitoring, traffic control, and so forth . This necessitates network algorithms that achieve and maintain global time synchronization at all network nodes, that is, algorithms that align all network nodes to a common notion of time. Due to imperfections in low-cost hardware nodes and the decentralized nature of wireless sensor networks, global time synchronization has been recognized as a particularly challenging task. Conventional synchronization protocols such as time-synchronization protocol for sensor networks (TPSNs) , reference broadcast synchronization (RBS) , and flooding time synchronization protocol (FTSP)  aim to perform centralized global synchronization for all nodes in wireless sensor network . These protocols achieve synchronization via time-stamped packet exchanges with a root node or a data fusion center and are thus vulnerable to failure of these central nodes. Recently, several distributed time synchronization algorithms have been proposed. One important class of such algorithms is referred to as distributed consensus time synchronization (DCTS) . In the DCTS approach, a global time consensus can be sufficiently reached within a connected network by averaging pair-wise local time information at network nodes. In , Olfati-Saber et al, established a theoretical framework for the analysis of consensus synchronization algorithms. Later, a fully distributed, asynchronous DCTS algorithm was proposed in ; this scheme was designed to reach agreement on time offset and skew offset between network nodes using media access control (MAC) layer time-stamped packet exchanges. As an alternative, a physical layer-based DCTS algorithm was introduced in  by modeling sensor nodes as coupled discrete-time oscillators. In particular, the algorithm adopts instantaneous received powers as weighted coefficients when updating local clocks. To the best of our knowledge, existing literature on DCTS methods assumes that local timing update at each node is done using only current timing information, that is, via a first-order DCTS (FO-DCTS) approach. In contrast, a second-order DCTS (SO-DCTS) algorithm would utilize not only current timing information but also that available from the previous iteration of the algorithm to update local clocks. Such an extension to the basic consensus algorithm was first reported for a continuous time approach in . Subsequent papers have analyzed this second-order continuous time consensus method assuming fixed network topologies , time delay , and switching topologies . In this paper, we apply the principles of the second-order consensus approach to the distributed timing synchronization problem in wireless sensor networks. Specifically, we propose a novel discrete-time SO-DCTS algorithm for wireless sensor networks and examine its convergence properties. The major contribution of this paper is the theoretical analysis of the convergence characteristics of the SO-DCTS algorithm for both directed and undirected networks. Moreover, we investigate the convergence region and optimal convergence rate of the SO-DCTS algorithm in undirected networks and claim that the optimal convergence rate of the SO-DCTS algorithm is superior to that of the FO-DCTS algorithm under an appropriate algorithm design. Finally, we present the asymptotic expectation and mean square synchronization error of the SO-DCTS algorithm when the timing offset between network nodes is Gaussian distributed. This paper is outlined as follows. Section 2 describes the system model and background for the proposed SO-DCTS algorithm. Section 3 presents the convergence properties of the SO-DCTS algorithm in directed and undirected networks. 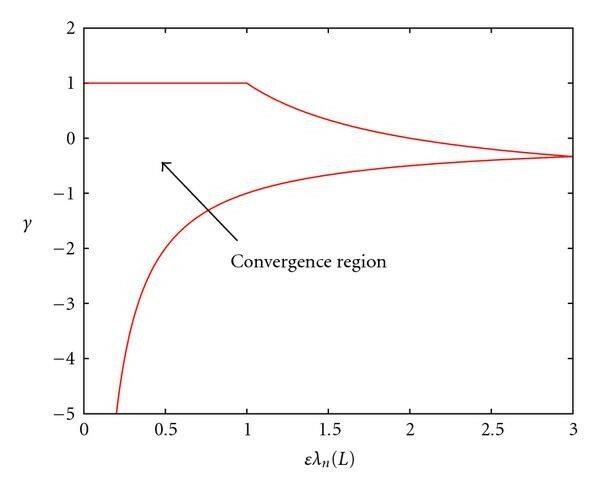 Section 4 discusses the convergence region and optimal convergence rate of the SO-DCTS algorithm in undirected networks. In Section 5, we present some convergence results for the SO-DCTS method when network nodes have Gaussian delay between each other. Simulation results are presented in Section 6, and we conclude our discussion in Section 7. Timing information between network nodes can be exchanged either using time-stamped packets at the MAC layer or by estimating arrival times of neighboring nodes' physical layer pulse signals. In the following, we describe the SO-DCTS method regardless of whether it is implemented at the MAC or physical layers. In each iteration of the SO-DCTS algorithm, each node processes and decodes the time-stamped message from its neighbors or estimates the arrival time of its neighbors' pulse signals. Each node then updates its local clock using the weighted average of the current time differences between itself and its neighboring nodes as well as stored time differences from the previous iteration of the algorithm. It should be noted that in the SO-DCTS algorithm, each node needs to store time information from its neighbor nodes for both the previous and current iterations; this is in contrast to the FO-DCTS approach where only the current time information is processed in the current iteration. where is the local time at node during iteration ; is the set of neighboring nodes that can communicate reliably with node ; is a constant step size; is a constant for each iteration. We assume that initial conditions of the SO-DCTS algorithm are , where is initial time offset for node . It is worth mentioning that when , the SO-DCTS algorithm reduces to the FO-DCTS algorithm. In the following, we model a wireless sensor network as a graph , consisting of a set of nodes and a set of edges . Each edge is denoted as where and are head and tail of the edge , respectively. In a wireless sensor network, the presence of an edge indicates that node can communicate with node reliably. We assume here a connected graph; that is, there exists a directed path connecting any pair of distinct nodes in the network. Throughout our discussion, we assume a time-invariant and connected network unless otherwise stated. Then, the in-degree and out-degree of a node (denoted as and , resp.,) are given as , and Specifically, is also equal to the number of neighbors of node from which it can receive information reliably, that is, . Next, we let be the graph Laplacian matrix of which is defined as , where is the degree matrix of . Given this matrix , we can show that , where , and . In particular, for a connected graph, the rank of is . Furthermore, for a balanced directed network, the in-degree and out-degree of a node are equal, that is, , thus we see that . For an undirected network, the presence of an edge indicates that nodes and can communicate with each other reliably. Under this condition, we can also show that . Additionally, in this case, is a symmetric positive semidefinite matrix (implying that its eigenvalues are nonnegative), and its eigenvalues can be arranged in increasing order as . with the initial conditions , where . Here, denotes the identity matrix. In this section, we investigate the consensus properties of the SO-DCTS algorithm in directed and undirected networks. Additionally, we discuss the convergence rate of the SO-DCTS algorithm in such networks. The main result regarding the average consensus property of the SO-DCTS algorithm in directed networks is stated in the following theorem. where denotes the spectral radius of a matrix. According to Theorem 1, we see that in general, although average consensus is not achieved for directed networks, all nodes in the network can still reach a global agreement. By "average consensus" we mean that all nodes converge to the same timing which is determined by the average of the initial timing differences between the nodes. However, when the SO-DCTS algorithm is employed in either an undirected network or a balanced directed network, average consensus can be achieved asymptotically. We show this via the following theorem. We know that in a time-invariant, connected, directed balanced or undirected network, and . The rest of proof is similar to that of Theorem 1 and thus omitted here. One of the most important measures of any distributed iterative algorithm is its convergence speed. As we show next, the convergence speed of the SO-DCTS algorithm is determined by the spectral radius of , which is similar to the FO-DCTS algorithm . Given this dynamic of the disagreement vector, we note the following Lemma. where denotes the norm of a vector. which is equivalent to (16). This completes the proof. Therefore, we see that the convergence rate for the SO-DCTS algorithm in both directed and undirected networks is determined by the spectral radius of . In this section, we investigate more specific convergence results (i.e., the convergence region and optimal convergence rate) for the SO-DCTS algorithm in undirected networks. Without loss of generality, we assume that and are real values, and . The convergence region of the SO-DCTS algorithm in undirected networks is shown in Figures 1 and 2 using a three-dimensional and two-dimensional perspective, respectively. We see that compared to the FO-DCTS algorithm where the range of the step size is , the range of in the SO-DCTS approach increases to . 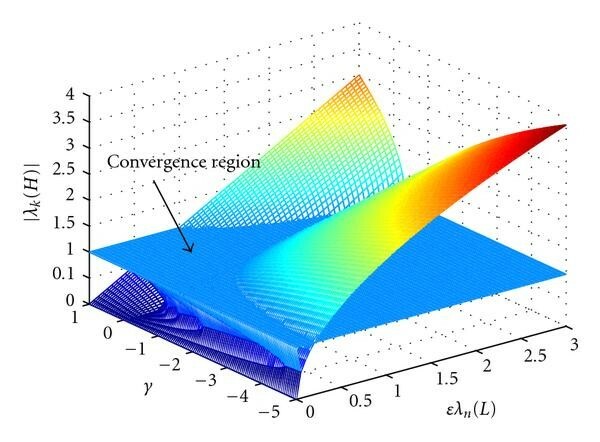 Convergence region for the SO-DCTS algorithm in undirected networks: three-dimensional view. Convergence region for the SO-DCTS algorithm in undirected networks: two-dimensional view. As we show next, the convergence rate of the SO-DCTS algorithm can be superior to that of the FO-DCTS algorithm by choosing suitable and . However, as stated in the following lemma, the convergence rate of the FO-DCTS algorithm is faster under some circumstances. For the SO-DCTS algorithm in (4) in a time-invariant, connected, undirected network with initial conditions and in (20), if , the convergence rate of the SO-DCTS algorithm is less than that of the FO-DCTS algorithm with the optimal constant step size in (21). The proof of this lemma is omitted here since it can be readily extended from the following result. Consider two real values and with , then . Thus, we have , which implies . We see that and only when . Thus, we have the following theorem for the convergence rate of the SO-DCTS algorithm. For the SO-DCTS algorithm in (4) in a time-invariant, connected, undirected network with initial conditions and in (20), there exists a pair of and such that the convergence rate of the SO-DCTS algorithm is greater than or equal to that of the FO-DCTS algorithm with the optimal constant step size in (21). In this section, we investigate the convergence properties of the SO-DCTS algorithm in undirected networks when there is both deterministic and random (Gaussian) delay between network nodes during local time information exchange. In , we motivate why the Gaussian assumption is appropriate to model the undeterministic timing differences between nodes exchanging either MAC layer or physical layer timing information. We do not reiterate those arguments here but rather present convergence results for the SO-DCTS algorithm when such timing differences exist. We have separately examined the performance of the SO-DCTS algorithm considering alternate delay distributions, for example, exponential delay distribution . Results show similar performance bounds as those presented in this paper for the Gaussian assumption. For this reason, we constrain our discussion here to the more common Gaussian delay model. where ; is a constant (deterministic) delay; is the distance between node and ; is light speed (thus, is the propagation delay between nodes and ); are independent identical distributed (i.i.d) Gaussian random variables, with zero mean and variance . 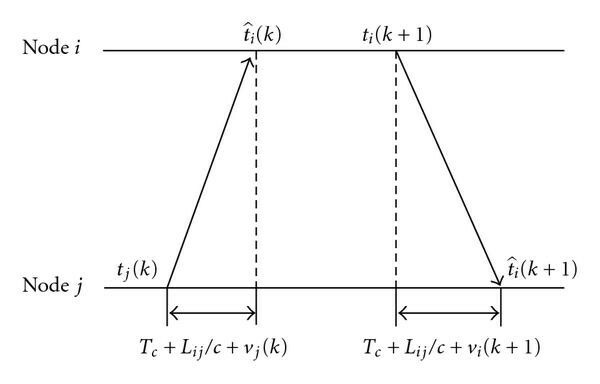 Local time information exchange between node and under this delay model is shown in Figure 3. SO-DCTS algorithm with Gaussian delay during local time information exchange. We now define and , where . Then, the noise vector in (28) is given as . Recall that for undirected networks, the average value in each iteration is . Thus, the mean and variance of the average value are given in the following lemma. The proof of this lemma is straightforward and thus omitted from this paper. It can be seen that as iteration time increases, both mean and variance in (30) increase linearly with the time index , that is, as the algorithm evolves. Furthermore, the variance of increases linearly with the variance of the random Gaussian delay, . As we will see in our numerical results, although the average value grows linearly with iteration time when there is Gaussian delay in the network, an average consensus may still be achievable under certain network topologies. In order to understand the convergence property of SO-DCTS algorithm with Gaussian delay, we first quantify the overall impact of uncertainty by computing the first two moments of the disagreement vector. where and . Then, we have the following lemma. The proof of this lemma is straightforward and thus omitted from this paper. Given these definitions, we next note Lemma 5. The proof of this lemma is similar to  and thus omitted from the paper. The above equation holds because . Before we investigate the convergence property of SO-DCTS algorithm with Gaussian delay, we give the following lemma for block matrix inversion. For this , we can show the following theorem. In an undirected network with fixed connected topology, in (39) is a constant vector independent of the constant values of and . Therefore, does not depend on and . This completes the proof. Hence, the maximum asymptotic expectation of the global synchronization error between any two nodes is Then, we have the following definition. A connected network is called "average consensus achievable with tolerable synchronization error" if the maximum asymptotic expectation of the global time synchronization error is less than a predefined threshold when applying the SO-DCTS algorithm in (28), that is, when . Similar to , we have Definition 2. In the following simulation results, we assume that the initial time offset of node is , where microseconds unless otherwise stated (trends similar to the ones noted below were observed when initial time offsets between nodes were arbitrary (e.g., when they were uniformly distributed over [0,T]). We use this fixed offset assumption here for comparison purposes). In our simulations, we examine the convergence performance of the FO-DCTS and SO-DCTS algorithms for several structured, undirected networks. Specifically, we study the following network topologies. "A Ring Network with Equal Distance ": A ring network is a network that consists of a single cycle. The ring network with equal distance is a ring network that has nodes, edges, and for and . "A Path Network with Equal Distance ": A path network is a network that consists of edge set . The path network with equal distance is a path network that has nodes, edges and for and . "A Star Network with Equal Distance  ": A star network is a network that consists of edge set . The star network with equal distance is a star network that has  nodes,  edges, and  for  and  . Figure 4 shows examples of these networks: a ring network , a path network , and a star network . Based on Definition 2, we see that is a "time delay balanced network" and . We now explore the convergence properties of the SO-DCTS algorithm for these structured networks via simulation. Structured networks: (a) , (b) , (c) . First we compare the convergence speeds of the SO-DCTS and FO-DCTS algorithms for the above structured networks assuming that the convergence rate is defined as , and there is no Gaussian delay between nodes. Table 1 gives the numerical values of the optimal convergence rate for the SO-DCTS and FO-DCTS algorithms under the , , and topologies. As expected, the SO-DCTS algorithm converges faster than the FO-DCTS algorithm in all three cases. Specifically, we see that the optimal convergence rate of the SO-DCTS algorithm is nearly twice as that of the FO-DCTS algorithm for all three types of networks. Numerical results comparing convergence rates of FO-DCTS and SO-DCTS algorithms in , , . In our simulations of the SO-DCTS algorithm with Gaussian delay, we assume microseconds and the optimal values of and from (24). 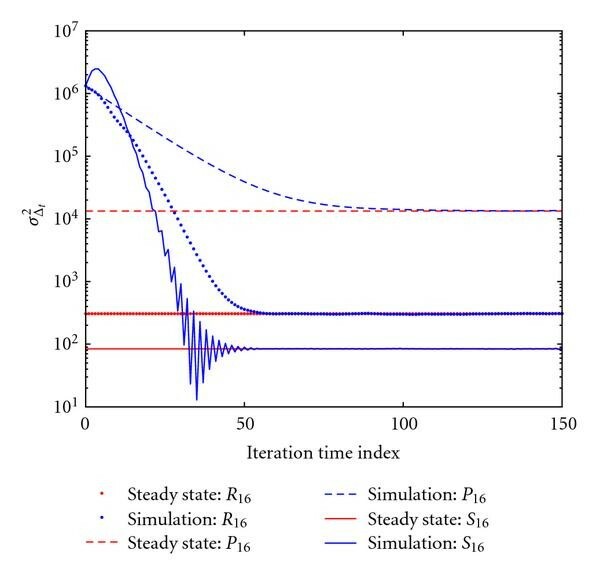 The simulation results and the asymptotic mean square time synchronization errors for the , , and networks are shown in Figure 5. For each network topology, the asymptotic mean square time synchronization error is calculated from (48). It can be seen that as time index increases, mean square time synchronization error approaches the steady-state value when utilizing SO-DCTS algorithm with Gaussian delay. Additionally, we see that the SO-DCTS algorithm performs poorest in a path network where it has the largest value of and the slowest convergence speed. This is not surprising since in such networks information flow from node 1 to node requires hops. Table 2 summarizes the asymptotic results of the SO-DCTS algorithm for structured networks. As expected, the maximum asymptotic expectation of global time synchronization error for is 0 since is a time delay balanced network. Furthermore, the SO-DCTS algorithm in has the largest because of its highly unbalanced time delay structure. It is worth mentioning that the SO-DCTS algorithm in star networks has relatively small values of and . In fact, the SO-DCTS algorithm for a star network can be seen as a type of centralized time synchronization algorithm in which a root node determines and propagates the average of local time information of all other nodes in the network. In Figure 6, we show the asymptotic value of as a function of the number of nodes in these structured networks. 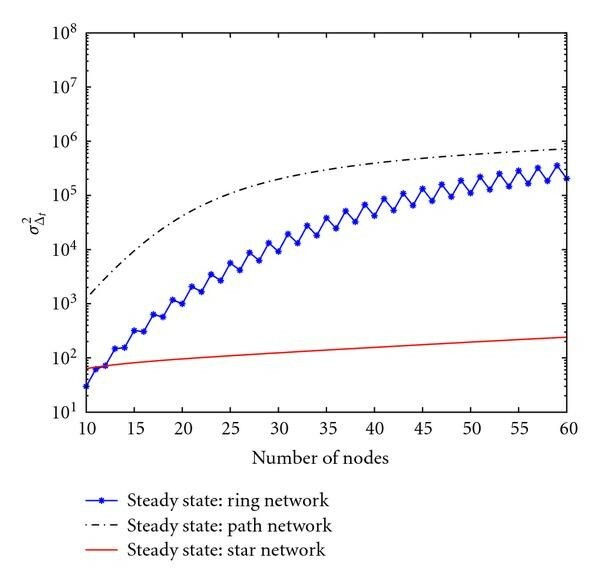 It can be seen that when using the optimal and , the asymptotic mean square time synchronization error for a star network is nearly constant as the number of nodes increases. However, is an increasing function of the number of nodes for both path and ring networks. Asymptotic results for the SO-DCTS algorithm in structured networks with Gaussian delay. as a function of the iteration time index for the SO-DCTS algorithm in structured networks ( , , ) with Gaussian delay. as a function of the number of nodes for the SO-DCTS algorithm in structured networks with Gaussian delay. We also present here simulation results for a random network comprised of nodes that were randomly generated with uniform distribution over a unit square kilometer; two nodes were assumed connected if the distance between them was less than , a predefined threshold. One realization of such a network with 16 nodes is shown in Figure 7. We assume that the average distance between two nodes is . 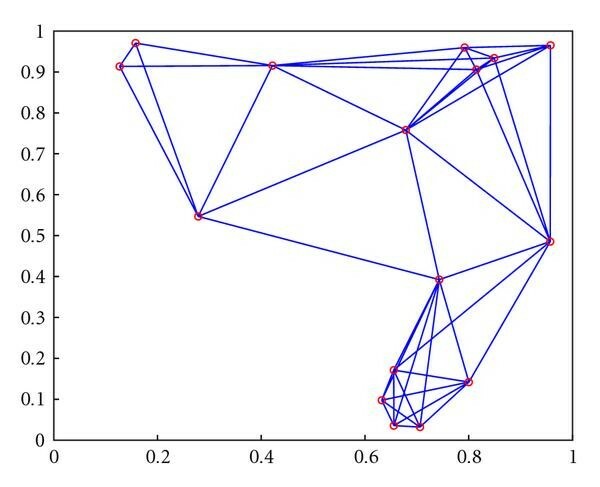 Random network with 16 nodes used to obtain simulation results in Figure 9. Figure 8 shows the simulation results for the convergence rates of the FO-DCTS and SO-DCTS algorithms in random networks with 256 nodes when without Gaussian delay between network nodes. Specifically, we plot the mean square time synchronization error (defined as ). In simulating random networks, we average results over 5000 network realizations. To obtain these results, we chose for the FO-DCTS algorithm and and for the SO-DCTS algorithm. In Figure 8, we observe that the optimal convergence rate of the SO-DCTS algorithm is faster than that of the FO-DCTS algorithm. In addition to the results shown here, we ran this simulation setup for various realizations of random networks, assuming both and a smaller network with . 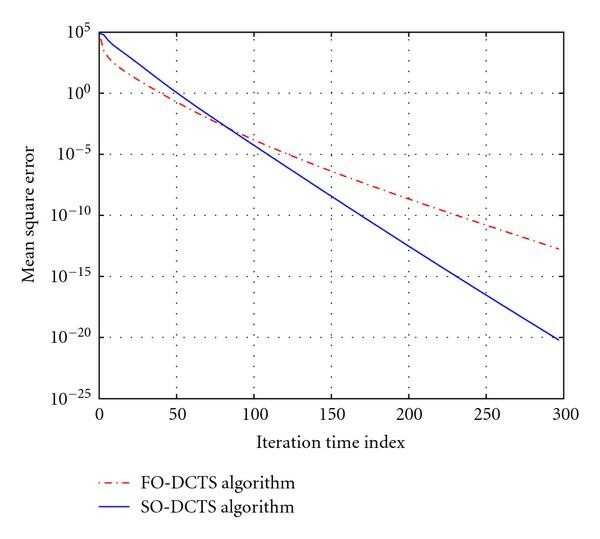 Overall, the results show a similar trend, that is, the convergence rate of the SO-DCTS algorithm exceeds the FO-DCTS algorithm. Evolutions of the FO-DCTS and SO-DTS algorithms in random network with 256 nodes when without Gaussian delay between network nodes. Figure 9 shows the simulation results when the SO-DCTS algorithm is implemented in a random network of Figure 7 assuming Gaussian delay between network nodes. As expected, we see here that an asymptotic global synchronization error persists between some pairs of nodes, that is, microseconds for this random network. If we specify a threshold to be greater than or equal to this , we call this network as "average consensus achievable with tolerable synchronization error" as described in Definition 1. Evolution of the average disagreement of the SO-DCTS algorithm in random network (see Figure 7) with Gaussian delay between network nodes. In this paper, we propose a novel discrete-time SO-DCTS algorithm to address the global timing synchronization problem in wireless sensor networks. We analyze several important convergence characteristics of the SO-DCTS algorithm for directed and undirected networks. Additionally, we investigate the convergence region and optimal convergence rate of the SO-DCTS algorithm in undirected networks and claim that the optimal convergence rate of the SO-DCTS algorithm is superior to that of the FO-DCTS algorithm under an appropriate algorithm design. Furthermore, we investigate the asymptotic expectation and mean square synchronization error of the SO-DCTS algorithm when there is Gaussian delay between network nodes. In the future, we intend to investigate the effects of skew, link failure, and other practical conditions when utilizing the SO-DCTS algorithm in wireless sensor networks. Now, we examine the convergence region for the SO-DCTS algorithm based on conditions , and . In the following, we assume that unless otherwise stated. By taking the union of in (A.5) and in (A.10) and considering the increasing order of , the convergence region for the SO-DCTS algorithm in (20) is obtained. Combining (B.3) with (B.4), we get (24). This work was supported in part by research grants from Thales Communications, Inc., Md, USA, and the National Science Foundation.